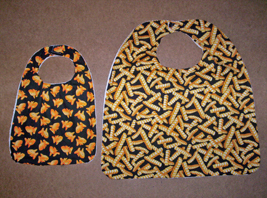 This is a picture of our standard baby bib and our standard toddler bib. The length is measured from the bottom of the neck. All of our bibs are custom made and can be made from any fabric that we show on any of the other pages.